Welcome at my "Wacom Intuos" web page. Wacom Intuos for OS/2 (ArcaOS, eComStation) - Click here for my "Wacom Bamboo" web page. This product is available free of charge and may be used at your own risk. Have fun. Click here for the ISC license. 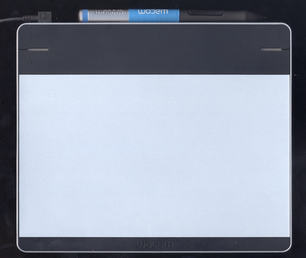 Description - Control OS/2 (ArcaOS, eComStation) with just a pen and a Wacom Intuos. Click here for derived product. Obtain this product here free of charge. Click here for source code. Click here for my home page. The Emulate Mouse Driver for OS/2 (ArcaOS, eComStation) is required. Obtain this product here free of charge. Move XSMOUSE10.ZIP into a directory of your choice and unzip it. Copy XSMOUSE.SYS to your C:\OS2\BOOT directory. The USB 2.0 Extended Control Driver for OS/2 (ArcaOS, eComStation) is required. Obtain this product here free of charge. Move USBECD23.ZIP into a directory of your choice and unzip it. Copy USBECD.SYS to your C:\OS2\BOOT directory. Move INTUOS01.ZIP into a directory of your choice and unzip it. Copy INTUOS.EXE to your C:\OS2\BOOT directory. Look into your CONFIG.SYS file to determine which mouse device driver has been installed on your system. You may find AMOUSE.SYS or MOUSE.SYS and you need to add the STYPE=XSMOUSE$ parameter to that device driver statement and to insert the DEVICE=C:\OS2\BOOT\XSMOUSE.SYS device driver statement just above it. Insert also the DEVICE=C:\OS2\BOOT\USBECD.SYS /D:056A:03##:01## /N:$INTUOS$ and RUN=C:\OS2\BOOT\INTUOS.EXE statements below these. After that restart your system and the fun begins. Attach your Wacom Intuos and wait for the beep. Pen buttons - The pen has 4 (CTH model) or 3 (CTL model) buttons. Use the pen tip (1st pen button) as mouse button 1. Use the lower pen button (2nd pen button) as mouse button 2. Use the upper pen button (3rd pen button) as mouse button 3. Expresskeys - These have no effect. All parameters are optional. Specify /c and the proper /hN and /wN parameters to work with precision. /c - correct aspect ratio. Requires proper /hN and /wN parameters. Specify this parameter to get circles on the screen from circles on the tablet. /hN - height of the display screen in N pixels. Defaults to 800. Specify this parameter to get precision. Valid values for N are 32 to 32768. /wN - width of the display screen in N pixels. Defaults to 1280. Specify this parameter to get precision. Valid values for N are 32 to 32768. /l - mouse setup for left hand use. Default is mouse setup for right hand use. Specify this parameter when the mouse setup page indicates left handed. /r - expresskeys at the lower side. Default is expresskeys at the upper side. Specify this parameter when the tablet has its expresskeys nearby. /m - pen in relative mode. Default is pen in absolute mode. Specify this parameter to move the pointer like a mouse. /bNNN - Assign mouse buttons to pen buttons. The 1st digit assigns mouse buttons to the 1st pen button. The 2nd digit assigns mouse buttons to the 2nd pen button. The 3rd digit assigns mouse buttons to the 3rd pen button. Default value is /b124. The pen tip acts as mouse button 1. The lower pen button acts as mouse button 2. The upper pen button acts as mouse button 3. My Wacom Intuos has 056A:030E:0100 as idVendor:idProduct:bcdDevice. I bought this CTL-480 tablet in 2014. I don't know if and where that tablet is for sale today. Thanks to Joop Nijenhuis for requirements and testing. © W.M.Brul 2014-2017, all rights reserved.